Depending on the hosting platform, your Windows Server 2012 Virtual Server will come with one IP addresses by default. For a Virtual Cloud Server you will be provisioned with one public IP address, and for a Virtual Machine in the Cloud you will be provisioned with one public and one internal IP address. You can add the additional public IP addresses when you purchase your Virtual Server, or you can add them afterwards. You can only add additional internal IP addresses after the VS has been purchased and configured. In either scenario, only the first IP address allocated when you purchased the Virtual Server will be automatically allocated, as the default IP address. Any additional IP addresses will need to be configured manually. 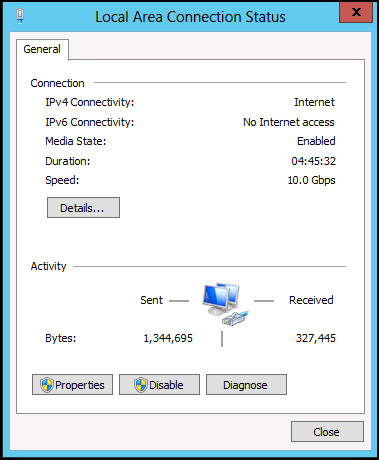 By default, your Windows 2012 Virtual Cloud Server comes with one public IP address. If you need additional IP addresses, including an internal IP address, you will need to purchase it. Once the IP addresses have been provisioned, the Virtual Server will rebuild the network. If you are connected via RDP, you may get disconnected. Once the Virtual Server rebuilds the network your IP addresses will be available for use, and the IPs will be visible in the Virtual Server Details for the Virtual Server. There should be no configuration required on the Virtual Server itself in order to use the new IP address. Adding an IP address for the Virtual Machine in the Cloud Hosting Platform is a two step process: 1) Provision the IP addresses from the Customer Portal, and 2) Add the IP address to Windows.If you do not do the second step, your new IP address will not be available for use. By default, your Virtual Server comes with one public IP address and one internal IP address. If you need additional IP addresses you will need to contact us. 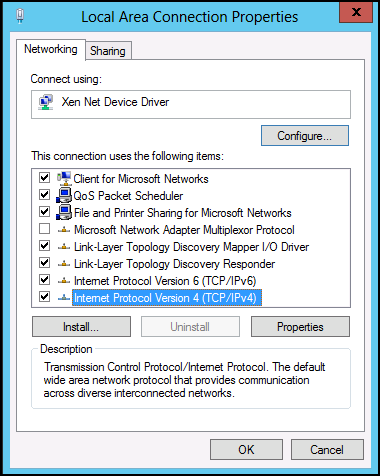 To add the new IP address to the Windows 2012 Server, you will need to connect to the VS using Remote Desktop as the administrator user. From the Windows desktop, move your mouse to the top right corner of the screen to bring up the Charms bar, and click on Start to bring up the Start screen. In the Start screen, click on the Control Panel tile, and then in the Control Panel screen click on View network status and tasks under the Network and Internet heading. This opens the Network and Sharing Center screen. 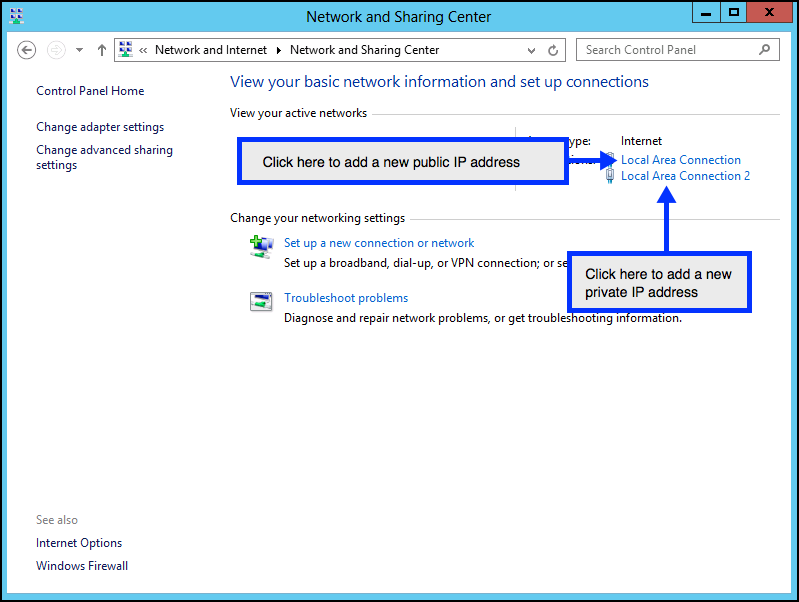 To add a new public IP address, click on Local Area Connection. To add a new private IP address, click on Local Area Connection 2. Clicking on Local Area Connection opens the Local Area Connection Status screen. Once you have clicked on Internet Protocol Version 4 (TCP/IPv4), click on Properties. This takes you to the Advanced TCP/IP Settings page. Click on Add... to add the new IP address. Make sure to click the Add button under IP addresses (outlined in blue) and not the Add button under Default gateways. This opens the TCP/IP Address dialog. Add the new IP address, and also the Subnet mask, and click on Add. This takes you back to the Advanced TCP/IP Settings screen, which should show the new IP address and Subnet mask (highlighted in yellow here). If so, just click on Yes to continue. Once you get back to the Network and Sharing Center screen, close that screen. Your new IP address is now added to your Windows Server 2012 VS. You can verify this by opening Windows PowerShell and typing in the ipconfig /all command. Look for the new IP address under the Ethernet adapter Local Area Connection section (highlighted in yellow here). If you added a private IP address, it will be under Ethernet adapter Local Area Connection 2. This shows that the new IP address has been successfully added to the Virtual Server and is ready for use.